ADTS provides the best fleet driver training available! Advanced Driver Training Services (ADTS) serves an important mission: that is to help organizations reduce fleet crash rates and minimize the resulting property damage, personal injury, workers compensation costs, lost revenue, and liability. Since 1983, ADTS has been the industry leader in helping companies and organizations, many in the Fortune 500, achieve these goals through our fleet training products and services. ADTS has trained well over 100,000 fleet drivers. ADTS Fleet Training services and products have been proven to improve the skills of drivers who spend their workday on the road. ADTS trains thousands of drivers in hundreds of cities annually in the U.S., Canada, and Puerto Rico, through a network of 100+ highly qualified instructors in major cities. It’s the industry’s most skilled instructor network – composed entirely of current or former police officers with extensive experience in accident investigation and reconstruction, traffic law enforcement, and safety policy and programs development. Advanced Driver Training Services, Inc. has been providing fleet safety services to corporations since 1983. ADTS has a staff of over 100 instructors located throughout the U.S. and Puerto Rico. 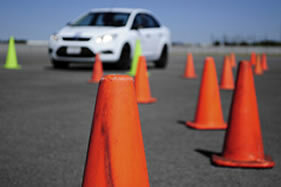 We have conducted behind the wheel driver safety training in North and South America, Asia and Europe. All ADTS instructors are current or former police officers with a background in accident investigation, accident reconstruction, or traffic safety. The knowledge they've gained in real-life crash situations is unrivaled by any other fleet driver safety training program. What kind of training does ADTS offer? ADTS' comprehensive line of fleet driver safety products and services includes behind-the-wheel training, classroom instruction, seminars, consulting services, online testing and training, computer-based training and a driver safety magazine. ADTS provides fleet driver safety training for Fortune 500 companies and organizations in the government sector. Our experience spans the full range of manufacturing, service, and public sector industries, with a particular emphasis in the pharmaceutical, chemical, and utility industries. Can I afford ADTS training? With the cost of an injury crash estimated to be over $70,000 (according to the The Occupational Safety and Health Administration), you can't afford not to use ADTS. You can tailor a fleet safety initiative to accommodate any budget, using our wide variety of training tools. What are the benefits of a fleet safety program? A safer, healthier employee – your most valuable asset – is the primary benefit. In addition, the training can significantly improve your bottom line. Cost-benefit analysis demonstrate that ADTS training can yield substantial savings in terms of avoided property damage, injuries, workers compensation, lost productivity, and liability. Our clients have documented actual savings in the millions of dollars! Where can the training be held? This is one of the features that distinguishes ADTS from other fleet driver safety training. We bring the training to your drivers, even for our behind the wheel programs – minimizing your drivers' time away from the job and the associated costs. Will my drivers be receptive to training? ADTS' programs are informative, interesting and dynamic. After attending the training, your drivers will be more confident in their ability to handle a crisis behind the wheel and better equipped to avoid a crash. I just wanted to send you an email about an incident that happened to me yesterday. I don't know if our company is still doing the ADTS advanced driving training that we did in March, but I feel that the skills I learned during that possibly saved my life yesterday. On the highway a construction truck pulled out right in front of me through an emergency vehicle median and, with the skills we learned, I was able to avoid that truck, weave through construction cones, and, avoid traffic in the next lane, all at 60 MPH! Obviously a scary moment for me but I just wanted to let you know that there is actual value that can be taken from that course and I am grateful those skills prevented a bad accident. I can honestly say that without that training, my life would have been substantially different, in a negative way, today so just wanted to say thanks! Hi all, Just wanted to let you know how valuable your course was. Today I had a car that just broke in front of me traveling at 50mph. The accident avoidance maneuver we were taught came to my mind in a split second and I just did that! I missed the car as I already had my exit strategy in place (the shoulder) I went from right to left then back to the straight position. It all happened so quick and I kept on traveling afterwards as if nothing happened. I don't even think anyone behind us even noticed that what I did was a safety maneuver since it felt so natural and probably looked very natural. Thanks again for your valuable training and the great instructors. Can you please let Mike know I was pretty grateful for the skills I learned on Monday. Yesterday, I was able to put some of those skills to use TWICE on my drive home. No joke. I was starting to wonder if getting home last night was in the cards for me. It was ridiculous…but those maneuvers worked like a charm. Division Safety Alert … Especially you folks in Chicago. Not more than 24 hours after our safety training, I was driving towards Chicago on I-290, traveling a safe distance back with both hands on the wheel, when what appeared to be a crow bar flew out of the pick-up truck in front of me. Going 55 MPH, I hit the brake and dropped below 30 MPH as the bar was roughly windshield height. Hands at 9&3, I manuevered onto the shoulder, straightened out, and had to quickly get back in the left lane as the truck had slammed on his brakes and pulled off onto the shoulder. Just a reminder to everyone, none of this means anything if you don’t get home every night to the ones you love. I completed the ADTS course Friday Feb 27 in Houston Texas. Rick, David, and Brian were the instructors. Brian was the driving coach and he drilled into us the accident avoidance maneuver. The following Thursday night I used this skill to avoid an accident. I was traveling 45 mph in the middle lane of a three lane road. There was a vehicle ahead of me in the right lane turning right into a business. There was a vehicle in that same entrance wanting to turn left. The right turning vehicle shielded the driver's vision and it pulled out if front of me. I knew the lane to my left was clear so I swerved left and then right once clear of the vehicle. Honestly I do not know how I missed the vehicle but I am glad I had recently practiced the skill. It would be great if you could forward this success story on to Brian.